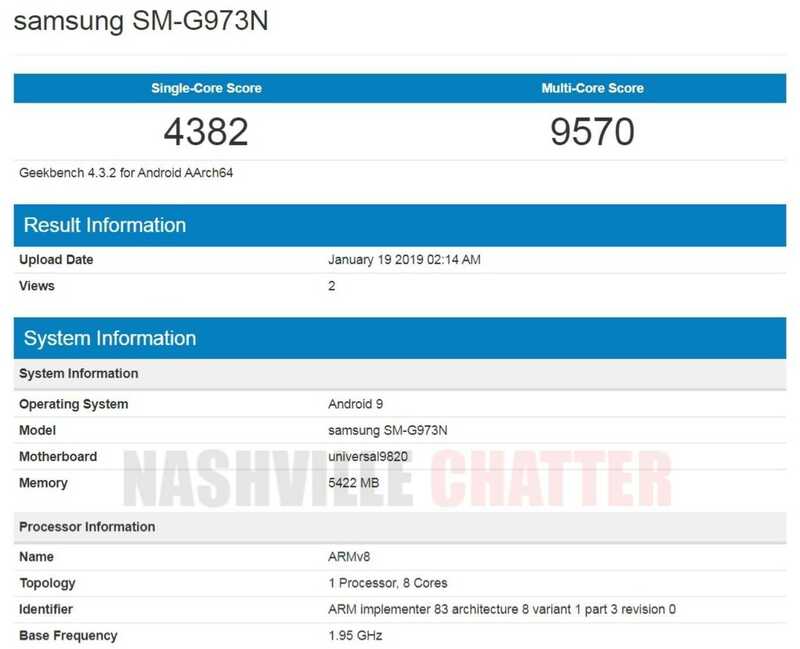 Samsung Galaxy S10 with model number SM-G973N has appeared on Geekbench confirming some of its specs. Samsung Galaxy S10 flagship that we have seen in Geekbench listing today is the third phone we’ve spotted on Geekbench. Galaxy S10 Lite (SM-G970U) and Galaxy S10+ (SM-G975U) have already appeared in the last few days. This new listing of Galaxy S10 has confirmed that the processor used will be Exynos 9820 and the RAM will be 6 GB. This phone would be released with Android 9 Pie out of the box. Interestingly, the single-core score of Galaxy S10 (at 4382 points) on Geekbench is higher than the Galaxy S10 Plus (3413 points) whereas the multi-core score of Galaxy S10 (9570 points) is slightly lower than the Snapdragon 855 powered Galaxy S10+ (10256 points). As we know by now, Galaxy S10 is the standard variant in the S10 lineup that includes Galaxy S10 Lite (or Galaxy S10E) and Galaxy S10 Plus. There’s also a special edition phone with codename ‘Beyond X’ and a 5G phone codenamed ‘Bolt’, which could be released separately after the Unpacked event. Some of the specs of Galaxy S10 are already known and confirmed. One among that is the display which is going to measure 6.1 inches and will be curved at the edges. This full screen display phone has a small bezel at the top and a punch-hole at the right top corner for the front camera setup. This phone will also have ultrasonic in-screen fingerprint scanner. The price of the phone is rumored to be around $799. As we reported early last week, Galaxy S10 and S10 plus would have moderate charging specs that would be on par with some of the old flagships the company has released. The battery capacity is expected to be 3500 mAh. Samsung’s S10 trio is all set to debut on February 20 in the Unpacked event, as confirmed by Samsung. Over the past several months, we have seen a lot of leaks and rumors about all three devices in the S10 lineup, including the 5G phone.